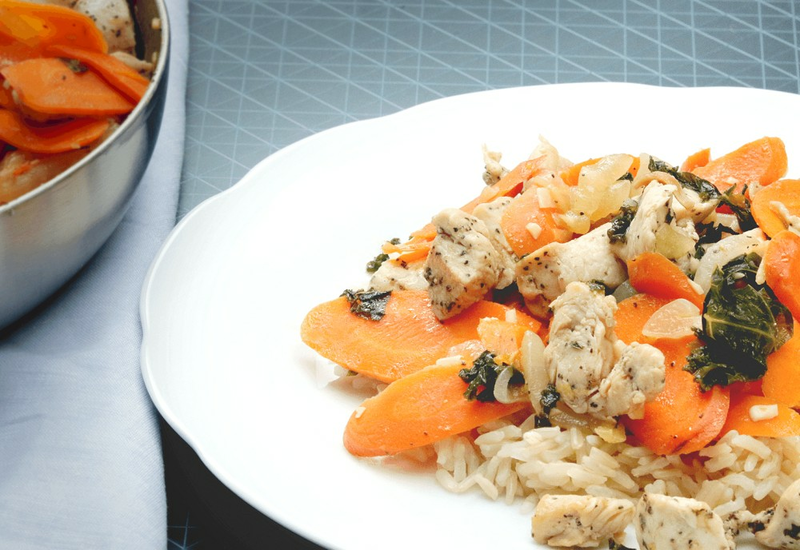 Seasame oil and butter work together to make a delightfully aromatic sauce in this elegant chicken stir-fry recipe with carrots. Carrots, onion, garlic are sauteed until tender and then chopped kale is quickly wilted in the same skillet. The vegetables are seasoned with rice vinegar while the buttery chicken is prepared. Best part is, the whole meal is ready to enjoy in just about half an hour. Add this Asian-American fusion dish to your weeknight meal line-up! If kale isn't your thing, give spinach or chopped bok choy a try. Any of your favorite hearty greens would work great here. Per Serving: 746 calories; 56g fat; 20.1g carbohydrates; 42g protein; 148mg cholesterol; 906mg sodium. This was a really simple, light stir fry. I personally love cooking with kale, so this was a great recipe for me. It's a good and quick summery weeknight dish. I used about 12 ounces of baby spinach instead of kale which I didn't have at home. It was waterier than the video, but spinach releases a lot of water when you cook it so I don't think that was the recipe's fault. nice and light summer stir fry - the kale was good but I'll definitely try swapping in bok choy next time. Also, wild rice would make a great compliment to this dish. I swapped the soy sauce for tamari for GF option and liked how light and fresh this dish was. It didn't necessarily blow me away for flavor or originality, but then again I was looking for simple and it delivered. Easy weeknight dish for the whole fam and good for leftovers as well. I love all the fresh ingredients in this chicken stir fry. I used baby spinach instead of kale, and bought pre-cut carrots and onions from the store. This made it so easy, all I had to do was dump the ingredients in the skillet. Also, instead of soy sauce I used liquid aminos. Perfect for weeknights, easy, and tasty.